Hello there, I’ve got another self draft to share with you today. 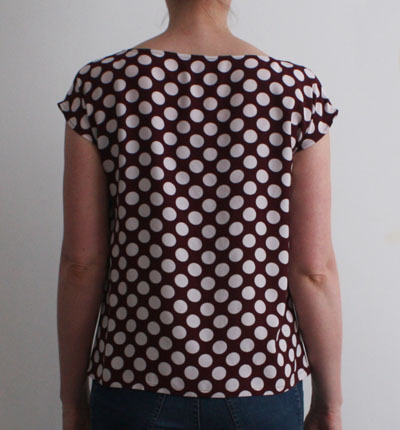 This time, a short sleeved kimono top, a basic shape so I thought it would be simple to draft. I think it has turned out ok, but wasn’t quite as simple as I had imagined! 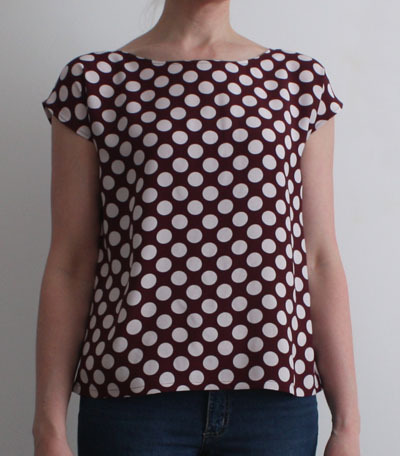 To create the pattern, I traced around three different top patterns I’ve made that fit reasonably well (Sewaholic Belcarra, Colette Sorbetto and Simplicity 1693), lining them up so that the waist point was the same for each trace. Then had a bit of a gut feel attempt at drawing the kimono top pattern (aided by internet pictures to get the basic shape). The arms didn’t fit at all well when I first tried it on! They were far too tight around the arms and felt a bit long so I cut about 5cm off and lowered the arm opening by about 10cm. This meant I didn’t have enough material to create a neat finish all around the arms, but as long as no one inspects my underarms close up this should be fine! 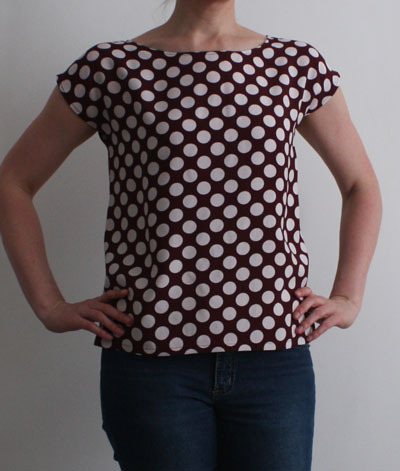 The fabric is a woven viscose from Fabric Land in Brighton. Given the boxy style, I definitely think a drapey fabric was required. 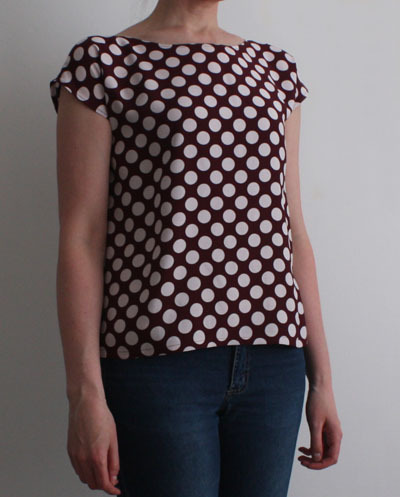 I’m not sure if I’d like this top in a solid colour (would want to tweak the arms a bit and perhaps make a bit more fitted first), but with this spotty fabric I think it works quite well. All in all, I’m quite pleased with this as a first version. There are definitely improvements to be made fit wise, particularly around the arms, but I think they would be worthwhile working on as the simplicity of the style would be great for showing off interesting fabrics. Hey I recognise this little baby! It looks fantastic Alex. Love the colour and the fit looks great too. On another note entirely – bet you are excited about the new Minion film!! Thanks for your help with getting the fit right! Yes, saw the new Minion film, its cool that Kevin is one of the stars as he was the first minion I made!